This particular Pyramid has had the following gemstones added to the mix in order to enhance its properties: Amethyst, Quartz, Amber, Black Tourmaline, Citrine, Ruby, Merlinite, Ametrine, Jasper, Tigers Eye, and Serpentine & Garnet. 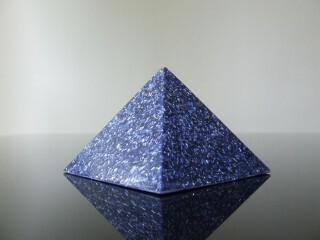 The Schumann Resonance Frequency of 13 Hz has been programmed into this Photon Orgone Pyramid whilst curing, I play the Schumann Resonance Frequency on a continuous loop whilst the cure. The Schumann Resonance Frequency has been used for many years, it is even used in NASA space crafts to stabilise their Astronaut's health to protect them from high levels of radiation in space. The 13 Hz frequency is also the level that the Earth's Magnetosphere resonates at. Wearing this Photon Orgone Pendant will protect you from other lower frequencies that put our body in a bad chaotic state. Research has shown that our brains resonate at this 13 Hz frequency. I have studied and researched ancient uses of gemstones and metals used in combination with each other using ancient American Indian methods so each item added to the resin compliments and enhances each other resulting in a super powered Photon Orgone device.